… And neither should you attempt to photograph it in one day either. Earlier this week, I returned from a great trip to Yosemite with my best friend Gary whom I’ve known since I was 16. I flew to Santa Rosa, Calif., The next day we headed to Yosemite National Park. It was a nice drive and great time to catch up with him. © Paul Conrad/Pablo Conrad Photography – The View of Yosemite Valley in Yosemite National Park, Calif., from the Tunnel View overlook. The best part was hanging out with Gary and catch up on everything in our lives. It was also fun just helping him learn how to use his gear get a decent exposure, and post processing in Lightroom. The night before leaving, we finalized plans on what we wanted to shoot. 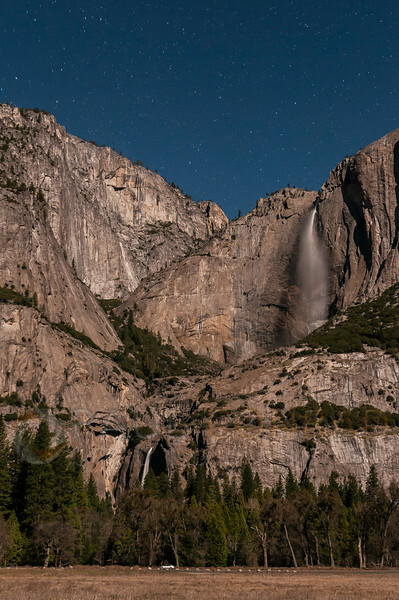 Basic stuff like a full Moon rising over Half Dome, the “Tunnel View,” El Capitan in morning light, Yosemite Falls lit with the full Moon. A fairly rigorous itinerary. 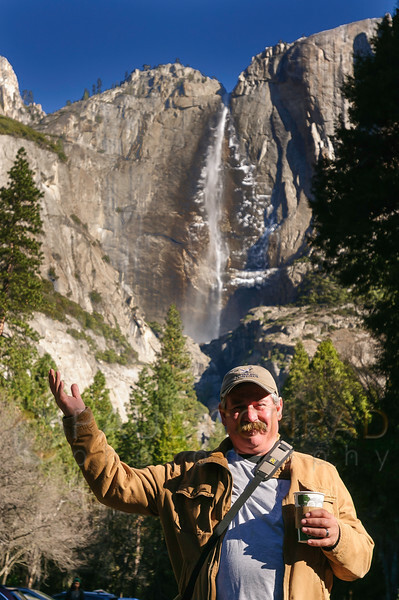 To help us plan our trip, Gary downloaded Michael Frye’s iPhone app The Photographer’s Guide to Yosemite. Very handy as you can plan your trip no matter the time of year. You can select what you want to shoot by month and place. It also has many photo tips. I fully suggest it for your trip to Yosemite. We arrived at Yosemite about 3:30 or so. Our first stop was the famous “Tunnel View.” This is the view that looks down the valley and you can see all the major formations: Half Dome, El Capitan, Bridalveil Falls, and so on. 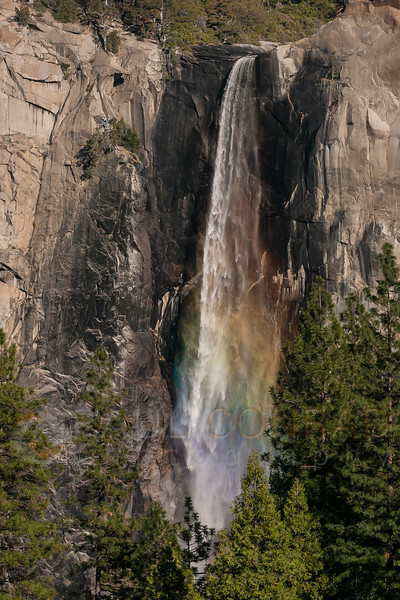 © Paul Conrad/Pablo Conrad Photography – The late afternoon Sun creates a rainbow in the mist of Bridalveil Falls in Yosemite Valley in Yosemite National Park, Calif., on Thursday Mar. 5, 2015. Afterwards, we checked in at the lodge about 5:30, unloaded our bags, took a breather, then headed out again. We wanted to be in a good spot as the full Moon rose over Half Dome. As the Sun set, I realized we were a day late. The Moon would be in stark contrast to Half Dome. TIP: To capture a really good photo of the full Moon rising over a landmark, you really need to shoot it a day or two before full. That way the setting Sun lights the monument/mountain/landmark AS the near full moon rises over it. Apps that help you plan your landscape photography are Sun Surveyor and The Photographer’s Ephemeris. © Paul Conrad/Pablo Conrad Photography – The full Moon creates a shadow as it begins to rise near Half Dome in Yosemite Valley in Yosemite National Park, Calif.. Even though the scene had too much contrast, we still shot it from Sentinel Bridge so we can get the reflection of Half Dome and the Moon in the Merced River. We did do a walk around as the banks were closed for revegetation. We wanted a clear shot from down low but that wasn’t going to happen. While finding a location for that shot, we discovered a great view of Yosemite Falls from the meadow. The full Moon lit the northern side of the valley beautifully. But, to get the Upper and Lower falls lit, we needed to wait at least until 9. At moonrise, the falls were in shadow. 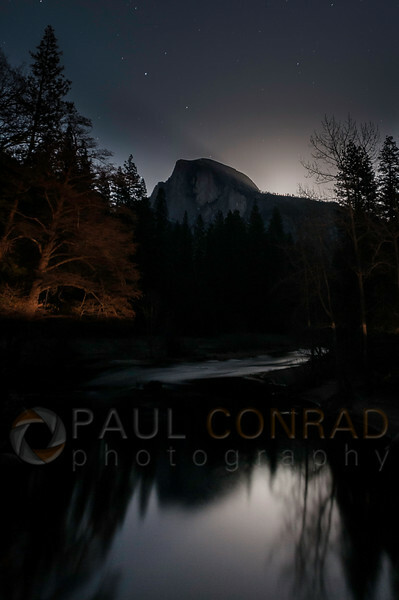 © Paul Conrad/Pablo Conrad Photography – Yosemite Falls under a full Moon in Yosemite Valley in Yosemite National Park, Calif.
After the Moon rose over a ridge south of Half Dome, we headed for the meadow to photograph Yosemite Falls in moon light. And it turned out, they became our favorite images. While shooting, I saw three barren trees against a ridgeline. While checking them out, I noticed how they repeated the pattern of Sentinel Rock. The trees were lit by the Moon and the pines behind them were in shadow. This added some contrast to the scene. 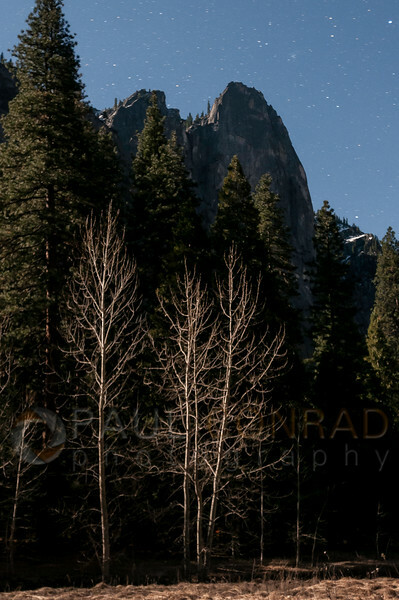 © Paul Conrad/Pablo Conrad Photography – Three trees seem to mimic Sentinel Mountain in Yosemite Valley in Yosemite National Park, Calif.
After our adventures, we headed back to our room Yosemite Lodge. 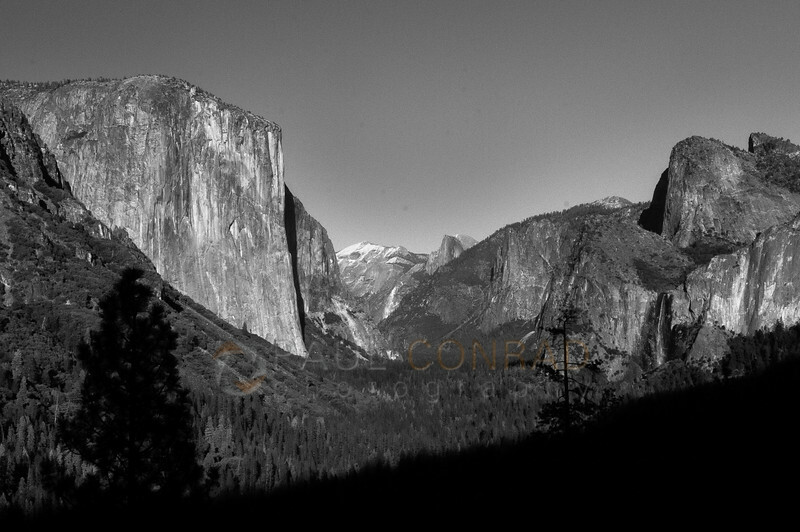 Our plan was to get up super early and photograph El Capitan and the Merced River. So we edited a few photos, posted a few on Instagram, Facebook, and Twitter. We arrived at our spot along the Merced River with about 45 minutes to spare. This gave us a little time to get a little picky on our composition. I had one big problem: my wide-angle was not wide enough. Ugh. 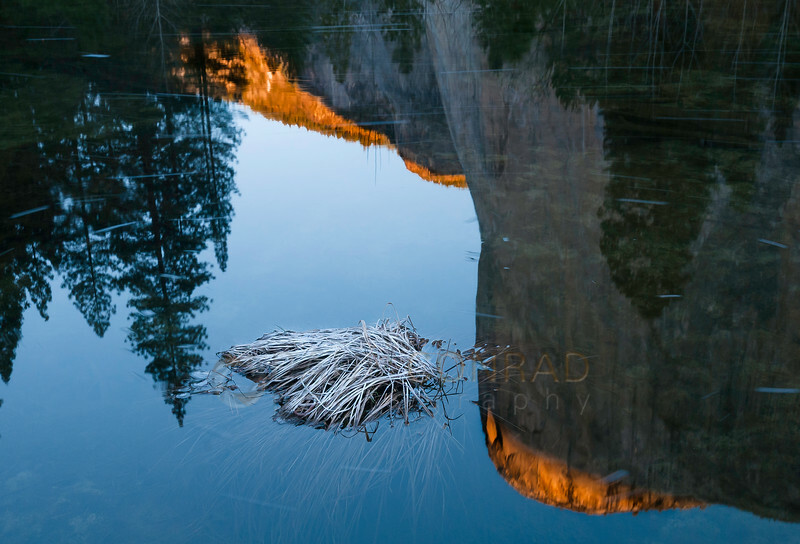 © Paul Conrad/Pablo Conrad Photography – Morning Sun lights El Capitan as it’s reflected in the Merced River in Yosemite Valley in Yosemite National Park, Calif. So, I opted to get creative. I found a patch of grass that was near the bank of the river. It was covered with frost and looked pretty cool. I composed my photo so the grass patch was between a tree and El Capitan in the reflection. I worked it as the Sun began lighting the ridge of El Capitan. With my camera on a tripod, I made small moves and worked fast. I think I got something relatively good. © Paul Conrad/Pablo Conrad Photography – Gary enjoying his coffee under Yosemite Falls in Yosemite Valley in Yosemite National Park, Calif.
My equipment was the usual: Nikon D300s, 17-35 f/2.8, 80-200 f/2.8, Manfrotto 055 XproB tripod, some head I’ve had for a dozen years, and a cable release. Pretty simple. Honestly though, I feel I didn’t get but one or two images, but I don’t care. Sometimes hanging out with your best friend is makes it all worth it.